This past month I was having one of those days. School just kept dragging on, I didn’t get enough sleep and through blurred vision the desks began looking like pillows, I wore booties to school on the one day it chose to snow. For those of you who don’t know what booties are, let me enlighten you. Booties are slippers that look like boots and have only fluff between your feet and the floor. My closet is filled with them and I firmly believe that everyone should own a minimum of one pair. 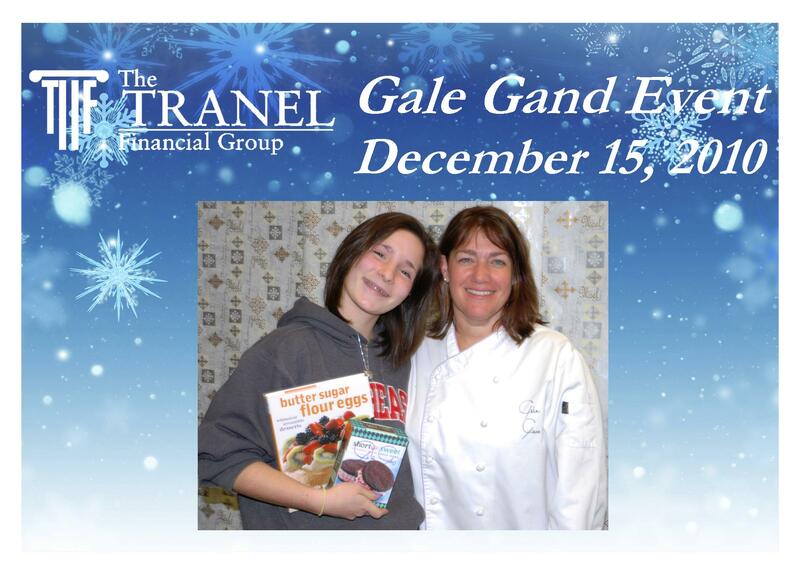 As you can probably imagine, each class grew about nine hours longer knowing in the back of my head that at the end of the day I was going to be seeing Gale Gand.- an extremely famous pastry chef that has been on The Food Network, has published multiple cookbooks, and owns the popular restaurant Tru. My mom and I got tickets to a demonstration she was doing at a local bank! 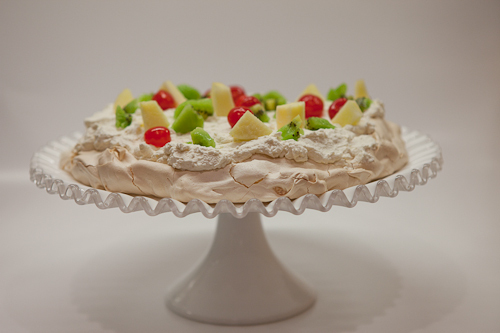 Gale showed us how to make a number of things but my by-far-favorite was her Pavlova. She made me a believer in meringue. It’s a miracle! Meeting her was really cool and her advise to me and other young chefs, bakers, future pastry chefs was : Cook through a good cookbook. Which is why I am currently working on cooking through her cookbook, Butter Sugar Flour Eggs. It’s an amazing book filled with dessert recipes. Of all her published cookbooks she said Butter Sugar Flour Eggs is her go-to book when she’s wanting to make a recipe. The much anticipated day was not a disappointment! I walked away with a little more knowledge, a signed book, and a picture to hold onto the memory of the night I got to meet Gale Gand. After giving Gale my e-mail and telling her I could help out if she ever needed it, I’m crossing my fingers that I won’t need a picture to remember her. I’ve discovered that life is too sweet to hold onto maybe’s. She hasn’t e-mailed me back yet and I’m not going to hold onto what-if’s. If it’s meant to happen I’ll get to meet Gale Gand again. If not, it wasn’t meant to be. But I’m not walking away with nothing. No matter what, I’ve met her. I’m a little smarter than I was before. And now I own a book that documents some of the recipes of one of the top pastry chefs in the world. I just have to take advantage of it. Under Photos I’ll continue to add to a gallery of the recipes I make from Gale’s cookbook, Butter Sugar Flour Eggs. Check it out, along with the other tabs I’ve updated. They’ve all been changing, and you may find something sweet. The things we learn in high school hold complete relevance to my young adult life. I mean, I don’t know how I’d survive without having memorized the complete periodic table. Now if I ever find myself in a hostage situation, I can just shout out, au, gold! NA, sodium! ZR, Zirconium! DB, Dubnium! MN, Magenese! until their eyes glaze over and I can successfully carry out a karate-kid round-house kick. Perfect. And I’ll be able to say, Thank you, I owe it all to Miss. Crary. It’s rare even in the more artistic subjects that we’re allowed to venture away from the all-important facts. But after reading “Fahrenheit 451”, my English teacher said we had to make a project about the book that involved technology. K. And? But that was the end of it. We got to do anything. Faber, often described with green. Huge impact on Montag’s life, and opening his eyes to knowledge. Montag- made up of all the people, shown by the colors, that made such a huge impact on his life. The bottom is cracked until Clarisse came -the whipped cream, and helped him get his act together. 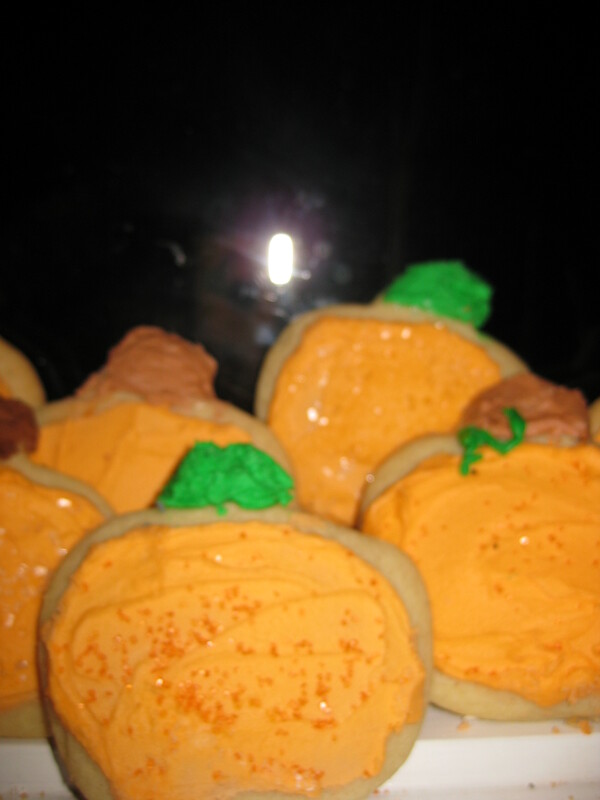 ﻿ The cookies I brought in. Thoughts: these are really great, and the frosting is really creamy! 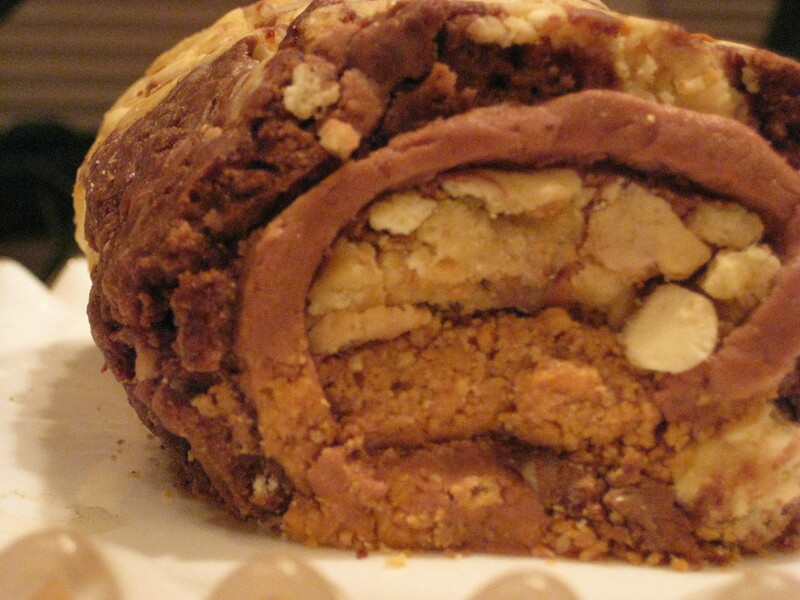 Tips- Don’t overbake these, they continue to get hard out of the oven. Add the chocolate, egg, and vanilla. Mix well. Combine dry ingredients and gradually add to creamed mix, beat well. 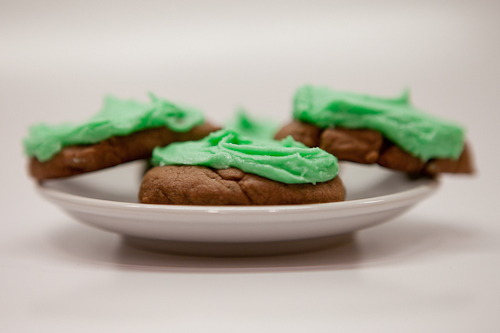 Combine frosting ingredients and frost when the cookies are cooled. Alright, since I added it to my slide show I’ve decided that I may as well give an explanation: the Margarita isn’t for me. Well it is, but it isn’t. You see, it’s for school. Yes, it’s for school. Before I read Fahrenheit 451 I did not plan on making a margarita. But what can I say? The book drove me to it. After swirling the cup in water and then sugar, I decided that that was it. I was giving up my dream of becoming a pastry chef. 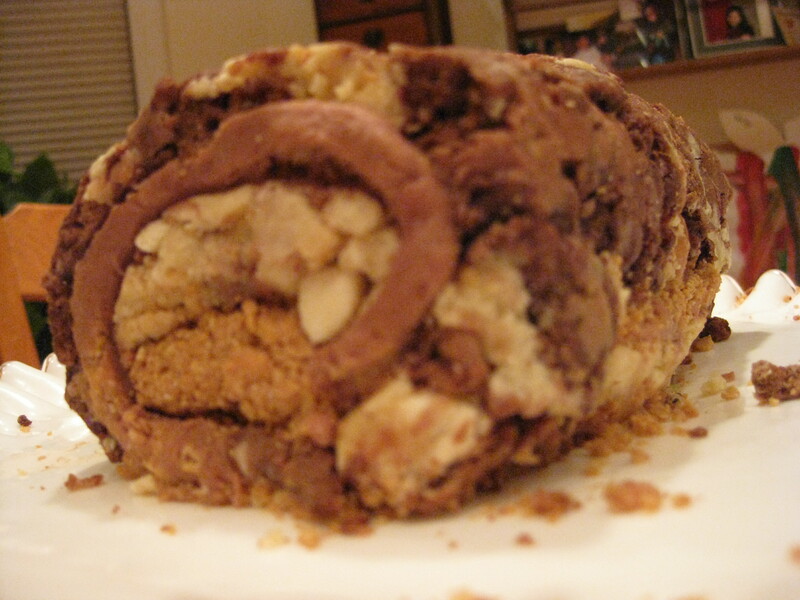 Why stand on your feet for hours pacing to the hot oven and back, rolling dough, staying up at all hours trying to get a frosting recipe just right when you could bar tend? Forget weighing sugar! Dip the cup to your heart’s content! One cherry on the side? Why not two? An unlimited world of possibilities. Until of course my brother walked by my Dad with one in hand. Yup, it was all downhill from there. And you know what? As serious as his face was I couldn’t contain myself from bursting into complete and total laughter. It was just so funny. You see Dad, I’m really sorry. I made it. I just had to let my brother try it. It’s amazing how smooth and serious a parent’s face can grow when they want it to, that’s when I broke. Alright, Alright. The “margarita” wasn’t even a margarita. 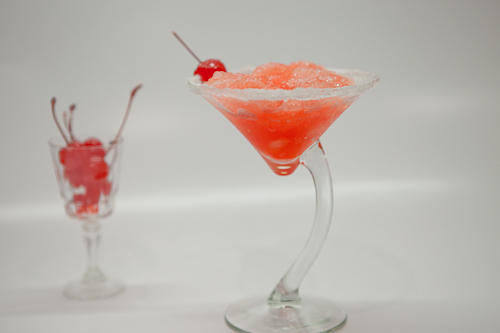 It was maraschino cherry juice, blended with ice cubes, topped with a cherry on the side of a sugared glass. And of course this project was fun but not just for fun, it was for my English class. The “margarita” which wasn’t even a margarita represented a character named Beatty who introduced the fact that drugs and alcohol were completely legal for all age groups their world. Well that’s what I get for going all out on a project. The scary thing is that most of the things from Fahrenheit 451, a sci-fi book written 50 years ago, have come true. Who knows? Maybe I’ll be bar tending sooner than I thought. Kidding. I’m only kidding with you Dad. Yesterday I had the sniffles. My head was throbbing. And all I wanted to do was curl up in my covers, lie there, and drift off into my dreams. Instead, I found myself with the chills, layered in two sweatshirts, a hat, my skinny jeans, and mittens, in my assigned seat waiting to take my driver’s ed final exam. My mind was chewing on four hours of studying, dealing with getting sick, and the obvious fact that if I didn’t pass this $500 dollar course, I could kiss driving goodbye. Permanently. Or until I could pay for the course by myself. Like I said, permanently. Our teacher started handing back test grades and I’m fairly sure those few minutes took off a few years of my life. He announced to our class that one person had gotten an F. One person. Well nobody admitted to getting the F, and it would figure that mine was the last in the pile. Slowly he handed my test back. I swear, my hands were going to shake right out of my mittens. There in my hand was not an F. My heart finally slowed to a healthy pace. My head stopped throbbing. The course was over. The very course where a friendly message had been written to us the first day of the class:Drivers Ed: the only course you will ever take where not doing well will kill you people! At times I doubted I would pass. But I made it. And surprisingly, all of my sick-symptoms were gone by the time I woke up the next morning. I’m not sure if it was the stress or my unwillingness to admit I was sick that made it disappear, but the next morning I felt great. Leaving cause for celebration that I PASSED DRIVER’S ED!Thoughts: This was super delicious! 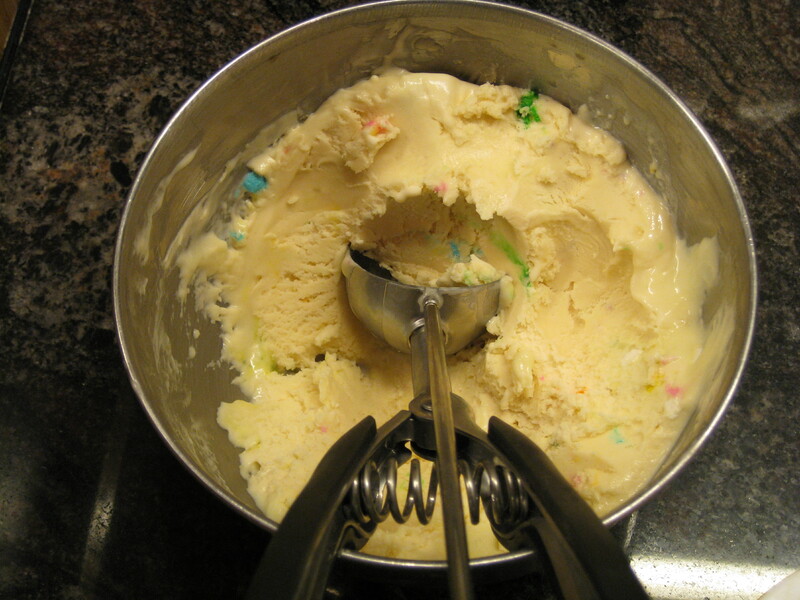 I always eat out of the bowl when I make cake batter. Afterwards I always regret it because of the raw eggs. This is just like eating cake out of the bowl, except better, and completely guilt-free. I’m not well-rounded in the ice cream world but my dad said it tasted like Maggie Moo’s Ice Cream Cake flavor. 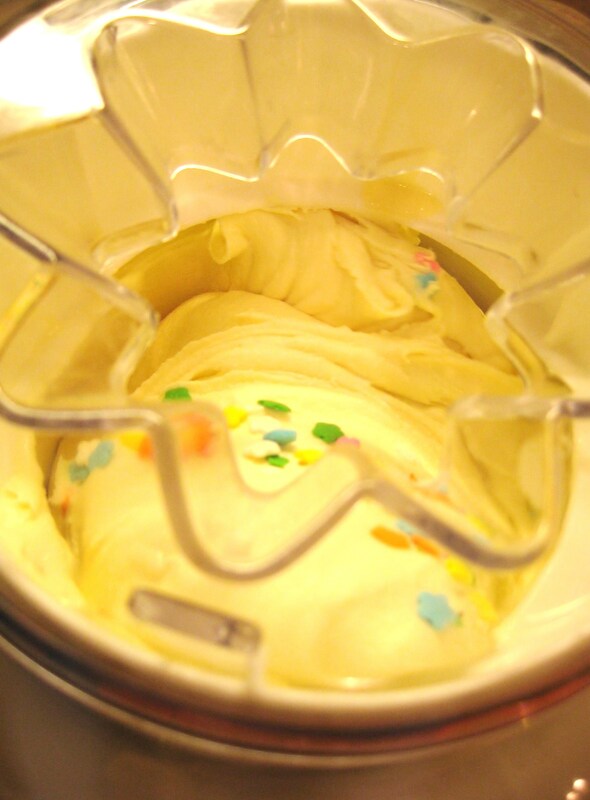 Tips: Don’t add sprinkles if you’re planning on only putting in a few because they won’t show up. I usually think that sprinkles throw off the texture, not in this!! Add to your heart’s desire!! Other than that, have fun!! 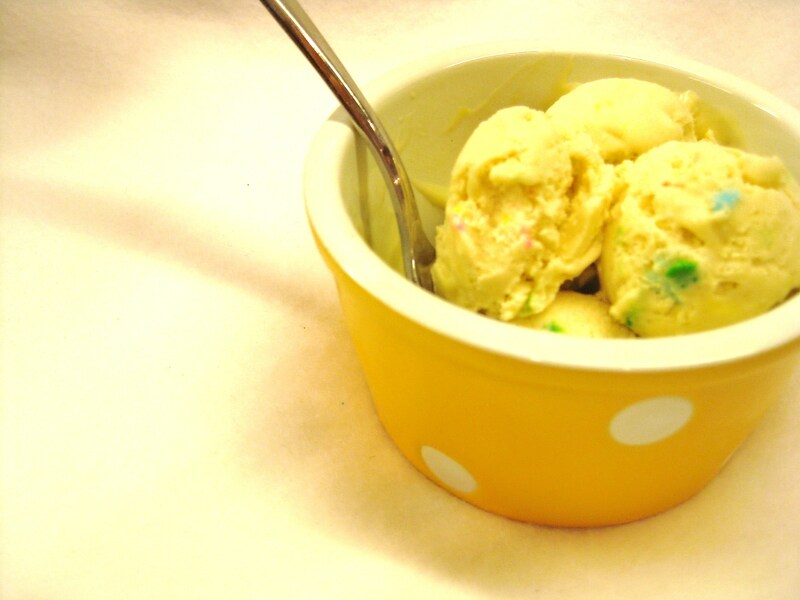 Ice cream making is easy-peasy! ½ box of yellow cake mix (yes, I said cake mix!! I found some in the back of my pantry. A miracle. Sprinkle away to your heart’s desire!! 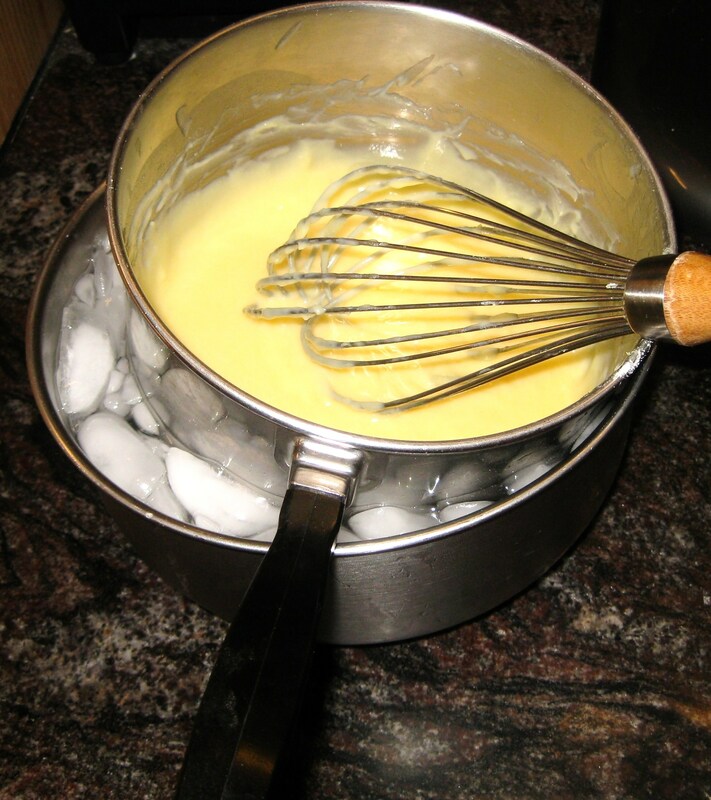 In a pan over medium heat, combine milk, sugar, and cake mix whisk to remove lumps. Stir constantly until the mixture begins to bubble. Add sprinkles in the last five minutes. This year, the day before Halloween I had my good friend C- over. I found myself freaking out before she came because I generally only have two friends over. And they’re the kinds of friends that reach in your fridge, walk in the door, and don’t give a second glance to the messes I don’t clean up. I swear, all of a sudden I’d grown a new pair of eyes that allowed me to see all the messes I hadn’t seen before. And it wasn’t looking too hot. By the time C- got here, I was ready to pass out from my spontaneous clean up session. Usually when I bake, I bake solo. Crowed kitchens with more than just me are a constant source of stress. I should probably work on the teamwork aspect of my life. Truly, I can be a team player anywhere else. But step into my kitchen and I might whoop you with a spatula. My friend knocked, and reluctantly, I pushed the broom back into the cleaning closet with my foot and opened the door. My feet weren’t the only things moving fast while I was cleaning, so was my mind. What should we do when she came over? All I could come up with was a movie and maybe making something. That was a big maybe. After all, my friend probably would rather watch a movie. Nope, it turned out she wanted to make something. I felt slightly inclined to deny her so that she wouldn’t have to see my inner chef-self. But that’s when she said it. Something that would forever hurt my heart. She had never ever had homemade frosting before. Yes, I said ever. And this is not an anti-social kid. One I’d attended multiple birthday parties with. And no homemade frosting. After that, there was no doubt in my mind. There was homemade frosting to be made, sugar cookie dough to be mixed and rolled out, and why not expand her knowledge and make royal icing too? For three and a half hours we were more than occupied. 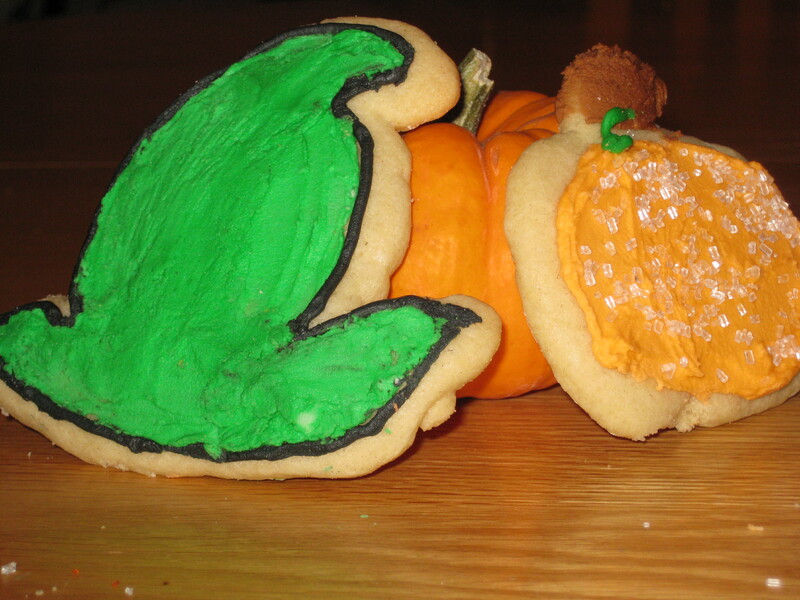 I don’t know what it is about sugar cookies. This wasn’t my favorite recipe but it just might have been the recipe to long conversations that kept me thinking well into the night after she went home. Thoughts: These were alright, my mom really liked them. 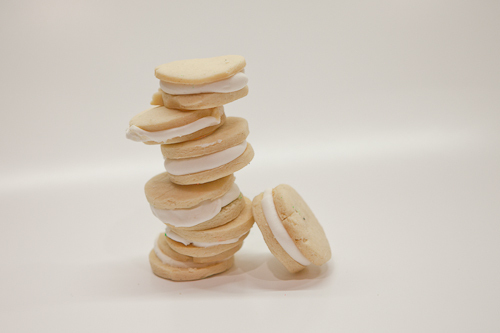 I prefer the other sugar cookie recipe I have posted. 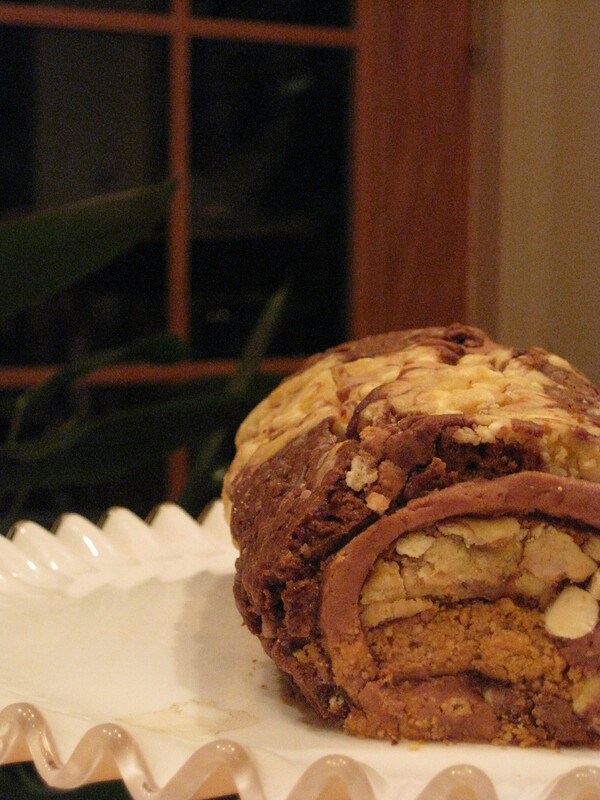 This is going to be your lighter recipe with more milky frosting. These also are going to break apart easier- bad for travel, better for home. They’re absolutely perfect if you don’t know what to do with your friends, and don’t want to keep watching movies though. 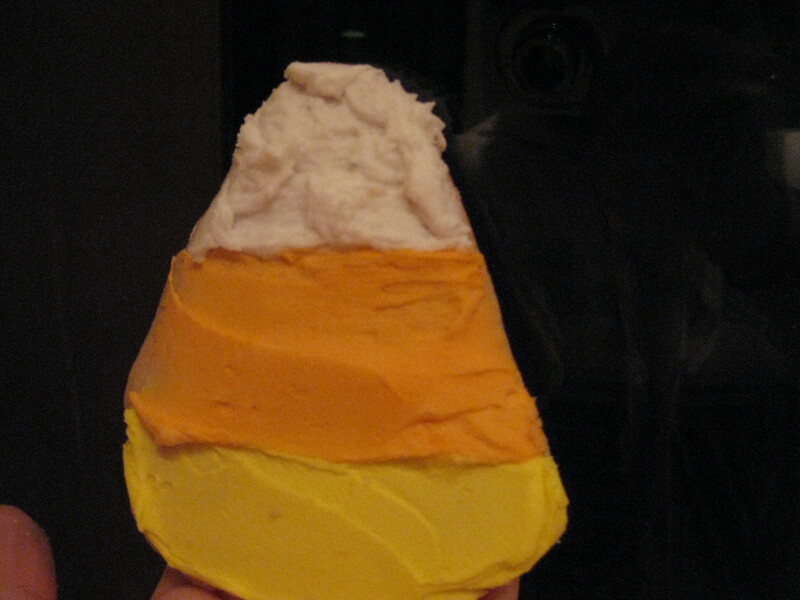 Tips: have a rounded knife without the jagged sides, otherwise you’ll see it on the frosting. 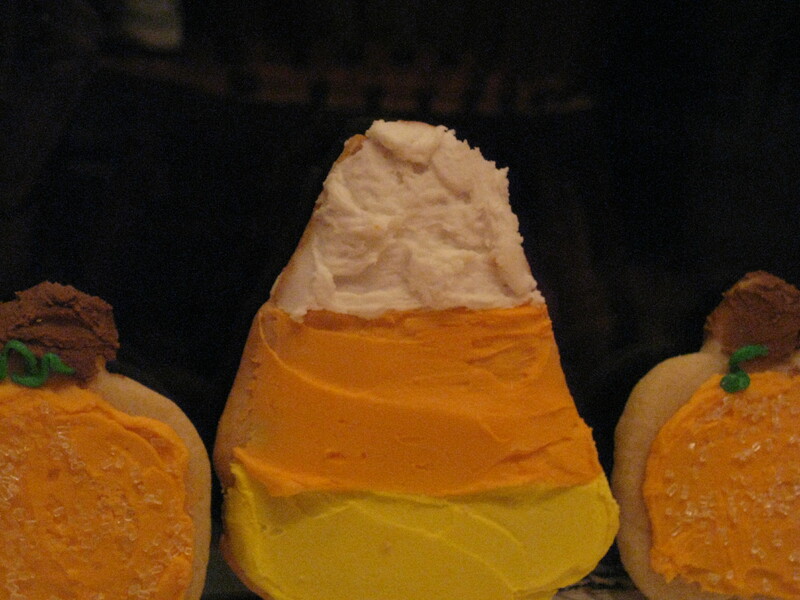 Definitely don’t over bake these because they dry out faster than you’d think. Definitely don’t start these at eight thirty like I did. Unless of course it’s the night before Halloween, you have a radio to jam to, and want to be the first one in your house to shout happy Halloween. – Or of course if you just don’t mind staying up late. Cream butter and sugar in mixing bowl until fluffy. Bake for 12 minutes, do NOT bake until brown. *Personally, I think shortening makes things taste store-bought and coats your mouth with a bad taste.